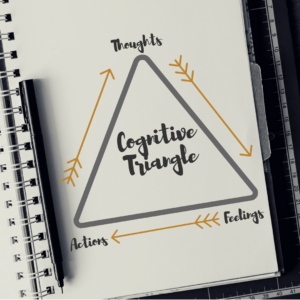 The Cognitive Triangle is one of the most popular and effective strategies that Cognitive Behavioral Therapists (CBT) use when supporting clients in improving anxiety, depression, and other life-style stressors. The idea behind this strategy is to help you start to connect your thoughts, feelings, and actions. By becoming more aware of how all three of these parts of your life affect each other, you can become more aware of how to change things. Usually, what happens in our lives is that a specific situation or life event will trigger a thought in your mind. That thought will in turn make you feel a certain way, which will make you do certain things. For example, if you are running late for a Doctor's appointment you might think "My Doctor is going to be so mad" which will make you feel anxious, nervous, and stressed. This in turn will make you do things like speed, check your watch, and maybe even run a red light. All because you are thinking that "my Doctor is going to be so mad". The idea behind the cognitive triangle is that once you are aware of these connections, you can start changing what you think or do in order to change how you feel. In today's blog, we will focus on changing what you do as the catalyst for change in this interaction. So, using the example above, instead of speeding, checking your watch, or even running a red light you do something else. For example, you could pull over, call the doctor's office, and let them know that you are running late. Most Doctor's offices understand and will tell you that it's OK. This phone call will immediately change your thought to "My Doctor isn't mad that I'm running late", which will reduce your anxiety and stress, which will allow you to drive safely to the appointment. Makes sense right? Now, of course there are some situations where this is harder to do. Especially if it's something that you continue to find yourself being anxious or depressed about, it might be hard to identify new and different actions to take. That's OK. If you need help thinking of new actions then just contact us and we will be glad to help you. We regularly use the cognitive triangle in our work with our clients in Illinois (Chicago), California (Los Angeles, San Diego, Orange County, Santa Barbara, San Francisco, Sacramento), and outside of the USA (Canada, Australia, New Zealand, England, Ireland, Scotland, Wales, United Kingdom, Germany, France, Spain, Mexico).